Hockey has been so enjoyable this season. I think part of the reason is that the lockout dragged on for so long that many of us hockey fans feared there wouldn’t be a hockey season at all. And we missed hockey a lot. So we are joyous to have it back. Another reason is that, because the hockey season is shortened to only 48 games, every game is important, so every team is giving its all in every game. Just last night, two games went to a shoot out. The Bruins were trailing the Rags Rangers 0-3 going into the third period, but Boston came on strong and tied the game, sending it to OT. They ended up losing in the SO, but at least they got a point out of it. Then, later in the evening, the Blackhawks and Ducks went to a shootout. Unfortunately for me, the Blackhawks lost, but at least they got a point. In this shortened season, every point counts. Big. Of course, while my eyes were busy watching these exciting and entertaining hockey games, my hands were busy knitting. I’ve been working almost exclusively on the Bayside Pullover. It is definitely autopilot knitting and a great project for hockey knitting. 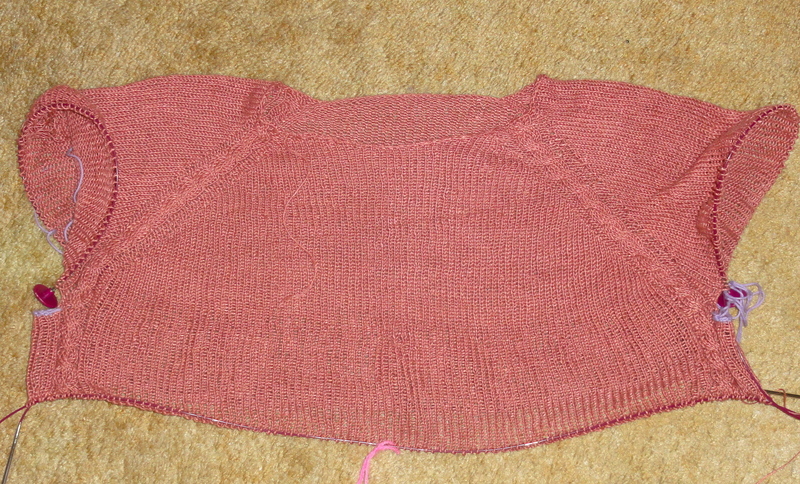 I’ve progressed quite rapidly on the sweater, but there have been a few bumps along the way. 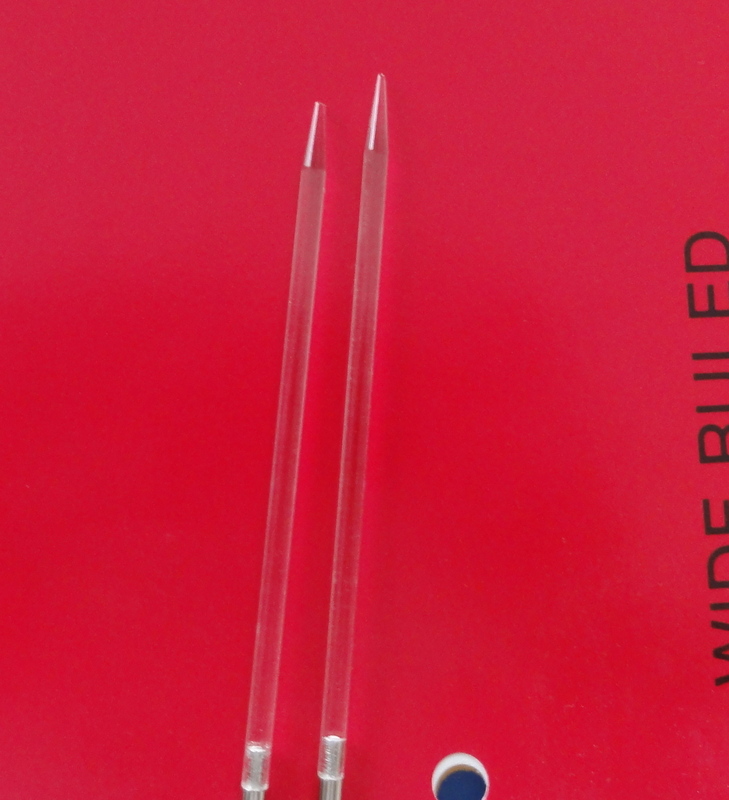 When my 40-cm Aero circular needle became overcrowded with stitches, I wanted to switch to my 60-cm Aero circular needle. But it is AWOL, and I have no idea where it could be. 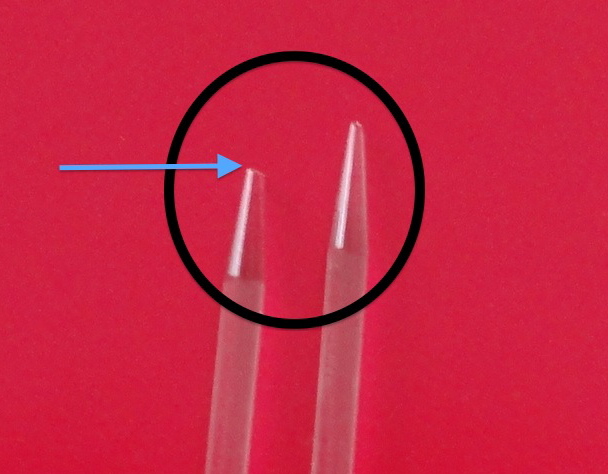 So I grabbed the handiest 3.5mm circular, which happened to be Knit Picks Zephyr acrylic needles that were on exactly the size cable I needed. I had bought one pair of Zephyr tips when they first came out so that I could give them a try, and this was the first time I had used them. I went to work on the sweater, and I was loving the Zephyrs, when this happened. Can you see it? If not, here’s a picture that is a little more “in your face.” You can’t miss it. Yes, the point of the needle broke off and went flying. Where it landed, nobody knows. Crap. I had to search for yet another needle. I ended up using Knit Picks Options, which are really nice needles, as long as the cable doesn’t decide to do something funky, like separate from the bushing while you are mid-row. So far, the cable is holding up just fine, and I’m doing everything in my power not to anger the knitting gods. The second road bump was a little more serious. I’m knitting this sweater in linen, and the only way to be certain about your gauge is to knit a gauge swatch, then wash and dry it. I did that, and was using the swatch and my rudimentary but adequate math skills to determine how many rounds I would need to knit to get the correct length. The pattern is knitted at a gauge of 9 rows per inch, and my gauge swatch was 8.5 rows per inch. 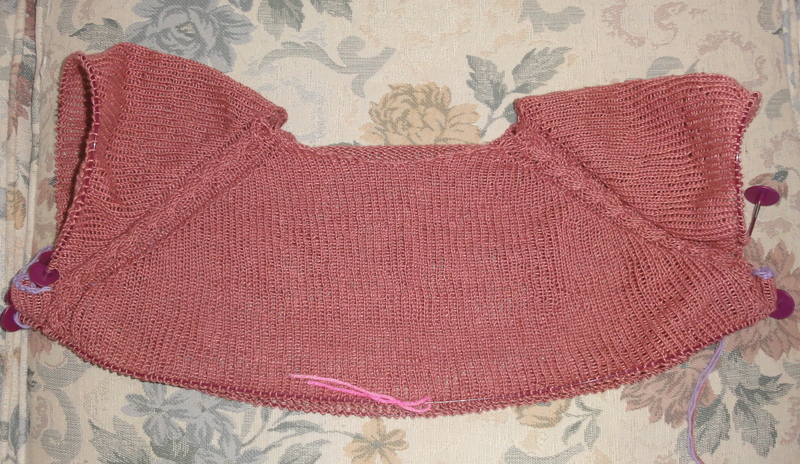 The yoke is supposed to be knitted to 7.75 inches long from the cast on edge, at which point the sleeve stitches are places on holders and the underarm stitches are cast on. I did the math–simple multiplication–and knitted the yoke until there were 66 rows (8.5 rows per inch times 7.75 inches equal 65.875 rows), then put the sleeve stitches on holders, cast on the underarm stitches, and knitted several rounds of the body. The yoke, of course, was not 7.75 inches long from the cast on edge, but the swatch told me it would be, once the sweater was washed. But, damn, it sure looked way too short to me. I just wasn’t trusting the swatch. So I did what any knitter would do when faced with nagging doubts. When I came to the end of the working ball of yarn, I put the stitches on holders and washed my work in progress. When it was dry, I measured and remeasured, and while my stitch gauge jibed with the swatch, my row gauge did not. In fact, my row gauge was 9 stitches per inch. This means that I can simply go by the measurements in the pattern. I don’t have to make any adjustments whatsoever because my gauge, both stitch and row, is spot on. So I ripped out the five or six rounds I had completed after casting on for the underarm and continued knitting the yoke until it measured 7.75 inches. I cast on the underarm stitches and kept knitting round and round, and now I have nearly reached the body decrease round. If you look closely at the picture, you can see where the washed section ends and the unwashed section begins. The fabric changes a lot when it is washed. This pattern is a lot of fun to knit. I will probably knit it up in wool for myself sometime down the road. And if Em likes her linen version, she, too, might get one in wool. Check out Tami’s WIP Wednesday to see what other clever folks are up to. This entry was posted in Knitting, Sweaters and tagged Bayside Pullover, Knit Picks Zephyr acrylic needles, knitting and hockey, Quince & Company Sparrow, WIP Wednesday. Bookmark the permalink. Your yarn is such a pretty color. Glad you’ve been able to work through the challenges. I actually read this when you first wrote it but was in a rush at the time…Since then, I have broken an interchangeable needle too, so I definitely share in your knitterly woes.